Smart businesses are shifting more and more online, changing from a local business to a world wide business serving customers all over. 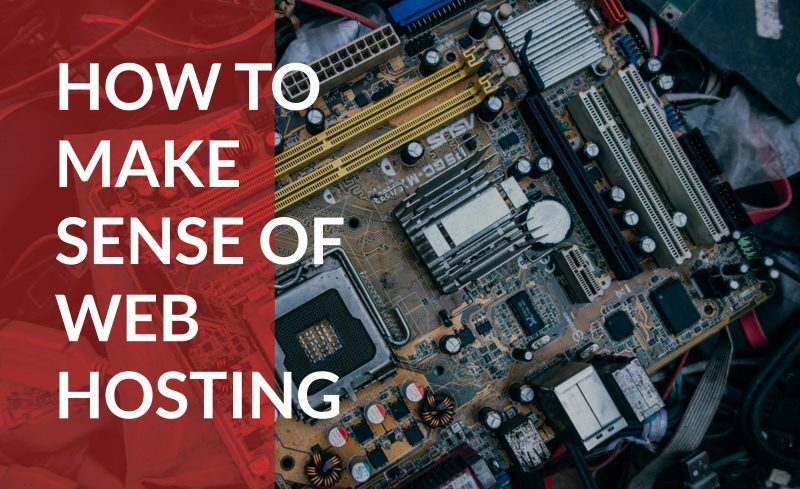 It’s helpful to understand the different aspects of web hosting before making a choice that will affect the growth of your business down the road. Use the helpful guide below to help your brick and mortar business establish a presence online, and take advantage of the mass exodus of customers looking to shop on the Internet instead of in person. Before defining web hosting, it is crucial that you first understand the definition of a website. A website is composed of interlinked web pages that are publicly accessible and listed under the same domain name. A website and domain name are different, and it’s important you understand these differences before getting started. These public sites can be viewed by just about anyone on earth with a phone, laptop, or tablet—and, of course, internet access. Websites can be owned by a person, a company, a group, or governmental organization; and these sites can serve a multitude of different functions. Altogether they make up the World Wide Web (WWW). There are three critical components to any website. They are the domain name, site files, and web hosting servers. Computers communicate with one another by using numbers known as IP addresses in a similar way to how you might use an address to find where someone lives or a phone directory to give them a call. Because a human’s memory is limited, especially when memorizing large series of random digits, the DNS (Domain Name System) was created to act like a phone book, which would list these IP addresses and the Domain Name registered to that address. These are the web pages your potential customers actually see when visiting your site. It includes photos, media files, graphics, scripts, and other .html data. This data tells web hosting servers how the page should look. These servers translate the files and then obey the right commands to display the desired website design and format. The physical location of your storefront is not the business itself, if you move, the business moves with you. If you set up shop elsewhere, the new storefront would still be the same business. The same goes for your web hosting. The simplest web hosting definition is that these web hosting servers are the rental space for your virtual store. All the saved files, data, and information that make up a website need to be securely stored somewhere. Without the hosting services, your files would have no place to exist, so your site would work about as well as a discontinued telephone number. When you ask the question, “what is web hosting,” it is important that you know the five primary types of web hosting. They are website builder, shared hosting, dedicated hosting, VPS hosting, and cloud hosting. Website builder services are a type of hosting service made for those people who do not have the technical knowledge to build a website on their own. Perfect for beginners, a website builder is the easiest way to sort out hosting, since everything comes bundled as a part of the plan. Here at Domain.com, our package includes deluxe web hosting, a free domain name, our Drag and Drop Site Builder, and Gmail for work. Our Drag and Drop builder lets you personalize your own website by simply pointing and clicking. It is easy to pick a background image and color scheme, add logos, create content, features, and design additional pages. Whether you want to start a blog, a wedding website, or an online store, a website builder is a fast, cheap and easy form of web hosting. We also offer Simple Scripts which is our assortment of quick-to-install applications designed to optimize and improve your website. Shared web hosting is the cheapest type of hosting available since you share a server with several other websites in order to split the cost. If you are a small business with a limited budget and not expecting heavy traffic, shared hosting is a useful method of cutting unnecessary costs. It should be noted that since these servers are shared, there may be website performance issues if one of the shared sites garners a lot of traffic. Dedicated web hosting services are when you are the only owner and user of a server. Because of this, your website and its performance will not be altered by another website. This service is more expensive, but it provides better tech resources than you would receive with shared hosting. Also, security will not be affected by traffic from another site. It is perfect for online businesses or stores experiencing robust, growing sales numbers. It is also ideal for those who need a lot of disk space, such as if you have an extensive email database. Few things can be more disastrous than your website crashing from an inability to handle heavy traffic—especially since it could possibly drive away one-off visitors. This is especially true if you are receiving a spike of traffic from the Slashdot Effect. While such viral traffic is unpredictable, you do yourself a disservice if your site is not ready to handle at least a modest spike of visitors. VPS Hosting stands for Virtual Private Server. This hosting service is a solid pricing middle ground between shared and dedicated hosting. You share a server but have your own definite area, leaving you less vulnerable to slowdowns from other sites sharing this private server. Companies who need an upgrade in their site’s bandwidth due to increased traffic are ideal users of VPS Web hosting. VPS offer better security, reliability, and ease of use without a large increase in cost. On top of that, VPS offers web hosting flexibility, as you can install your own operating system and add, remove, or modify software applications at your discretion. For a reasonable price, you get a completely customized hosting experience. Cloud hosting is when aspects of your website are shared across several different servers, which together function as “the cloud.” With cloud hosting, a faulty web server issue is not really a problem since another server can take its place and keep the site running. Cloud hosting is ideal for people who expect large volumes of traffic and do not want any bandwidth problems. Perfect for a site that projects continued growth and regular traffic surges. Some massive websites with access to their own coders or IT team will use collocated hosting, wherein they buy their own server and simply use a web host’s space to keep the server. These websites are in charge of server maintenance and have the option to install any desired applications or scripts. Although it is possible to host a website on your own computer, we would never advise it, as it is far more a hassle than it would ever be worth. Is it a WordPress blog? Do you need e-commerce features? Do you need a particular type of shopping cart software? Do you need the ability to handle business transactions on the site? How much growth do you expect? Do you require a type of script support? Do you need to utilize Windows applications or distinct software? Where do you see your company and website in six months? A year? Three years? POP3 (Normal inboxes), where the server grants you space to store emails. How much space you have for your website’s files. At Domain.com, all three of our web hosting plans come with unlimited* disk space. Bundle your costs – Domain registration and web hosting both cost money to maintain and operate. By keeping these services bundled, you centralize your costs, lower your overall rates, and have an easier time paying your bills. Link websites and domains – When you utilize Domain.com’s services for both domain registration and web hosting, linking your domain to your website is easy..
Ease of use – Bundling services allows you to oversee, manage, or change any aspect of your web hosting or domain in one, easy-to-reach location. Dependability – Our servers undergo ceaseless temperature and humidity monitoring. Fully redundant power and HVAC powered by dual independent power grids. Our locations have the very best in fire-threat detection and suppression systems, paired with seismically braced cabinets and racks. Safety – We offer 24/7 video monitoring, critical monitoring and secured access to the data center. All of our cabinets, cages, and suites are locked and secured. Redundancy – We offer full network redundancy with data backups and reliable data storage. Engineering & Design – We have the very best, state-of-the-art data centers, with multi-homed, redundant network connections. We use the best-of-breed, router, server, and firewall equipment and we never stop trying to optimize our network. Web hosting is often an overlooked component of a website’s ability to succeed or fail. Understanding your web hosting needs is a critical aspect of getting your website off the ground.